Earth's magnetic field, also known as the geomagnetic field, is the magnetic field that extends from the Earth's interior out into space. In space the earths magnetic field meets the solar wind which is a stream of charged particles mainly a mixture of materials found in the solar plasma, composed primarily of ionized hydrogen (electrons and protons) that emanate from the Sun. 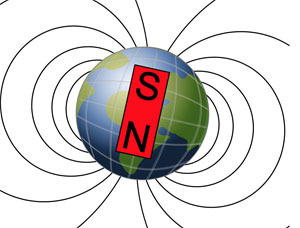 The magnitude of the Earth's magnetic field at the surface ranges from 25 to 65 microteslas (0.25 to 0.65 gauss). The Earth's magnetic field (magnetic dipole) is currently tilted at an angle of about 10 degrees with respect to Earth's rotational axis, It is as if there were a bar magnet placed at that angle at the center of the Earth. The North geomagnetic pole, would be located near Greenland in the northern hemisphere, is actually the south pole of the Earth's magnetic field, and the South geomagnetic pole is the north pole. Why is the north pole of the earth actually the south magnetic pole? The north pole of a compass points to the North Pole of the Earth. Since unlike poles attract, this actually means that our north pole is really the south magnetic pole. Earth's magnetic field is created by the turbulent motion of electrically conductive fluid, most of which is iron. However, since these interactions occur deep within the Earth, measuring and observing them directly is almost impossible. Scientists are pretty sure that the reason Earth has a magnetic field is because its solid iron core is surrounded by a fluid ocean of hot, liquid metal. So while parts of Earth's outer core are too deep for scientists to measure directly, we can infer movement in the core by observing changes in the magnetic field. Why does Earth's Magnet Field Change Direction? The last geomagnetic reversal for Earth was about 780,000 years ago. The historic reversal rate for Earth seems to be once every few hundred thousand years, but it has varied widely; on at least two occasions, the field has maintained one polarity for tens of millions of years. . "The Earth's magnetic field is thought to be generated by fluid motions in the liquid, outer part of the Earth's core, which is mainly composed of iron. The reversal process is not literally 'periodic' as it is on the sun, whose magnetic field reverses every 11 years. Why is this so? There are actually two magnetic fields within the earth --There is also a weaker field spread around the planet, not positioned along the north-south axis. The researchers suggest this weak field is created closer to the surface of Earth's outer core, while the stronger north-south field is produced throughout the core, including the deepest parts. Both fields are thought to result from the movement of electrons from hot iron atoms in the convective flow of the core, which is more of a liquid than a solid. The movement of the charged particles through the planet creates a magnetic field just as the movement of an electric current through a wire does.